I remember when I was smaller most people thought having stretch marks mean you'll be so fat or that you'll have a lot of kids; that's wrong. Sometimes bleaching creams can give you stretch marks. Stretch marks is not a disease, and both men and women have it. Pregnancy and puberty are the two most common times to get stretch marks. I do have stretch marks when I gain weight but they slowly fade away as I slim down. Without much ado, below are ten natural ways you can make the appearance of stretch marks less visible till they fade away. No. 9 is my favorite. Pure aloe vera is both a natural healing agent and a skin softener. 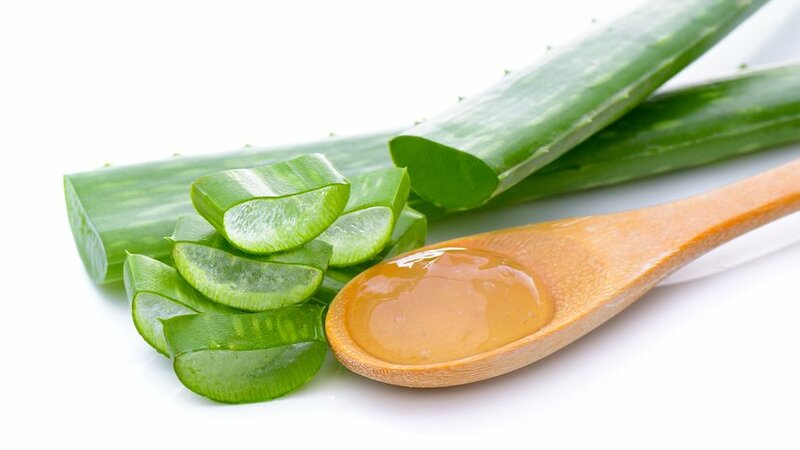 Apply pure aloe vera from a plant to your stretch marks daily after your shower. Do this consistently for a few weeks to see results. Most people prefer coconut oil, but I'm telling you the one I've tried out, and that's Olive oil. Apply virgin olive oil to your stretch marks each day to take away the red appearance. Sugar is a homeopathic microdermabrasion which helps in fading stretch marks. Mix one cup of sugar with 1/4 cup of olive oil or coconut oil till you get the consistency of a wet beach sand. Add some fresh lemon juice. Scrub the mixture on the part of your body where the stretch marks are. Repeat several times a week while in the shower, and please scrub for 8-10 minutes. I bet you didn't know this. Vitamin A also referred to as retinoid makes skin appear more smooth and youthful. You can use topical extract or take them orally. You can also take foods rich in Vitamin A like sweet potatoes and carrots. Castor oil which is used in the treatment of a number of skin problems like age spots, moles, dark spots, fine lines etc can also be used to get rid of stretch marks. i. Apply some castor oil to the stretch marks and gently massage the area in circular motions for 5-10 minutes. ii. Wrap the area with a piece of cotton cloth. Using a hot water bottle or a heating pad, apply some heat to the affected area for at least half an hour. For stretch marks, whip the whites of two eggs gently with a fork. Clean the affected area with water and then apply a thick layer of egg whites with makeup brush. Allow the egg whites to dry completely and then rinse the area with cold water. Apply olive oil to keep it moisturized. Repeat daily for at least two weeks to see results. Lemon juice is naturally acidic which helps heal and reduce stretch marks, acne, and other scars. Rub fresh lemon juice gently on the stretch marks using circular motions. Allow the lemon juice to soak into your skin for at least 10 minutes before rinsing it off with warm water. You can also mix equal amounts of lemon juice and cucumber juice and apply on the stretch marks. Potato juice contains vitamins and minerals that foster growth and restoration of skin cells. Cut a medium-sized potato into thick slices. Take one of the potato pieces and rub it gently on the stretch marks for a few minutes. Make sure the starch from the potato covers the affected area. Allow the potato juice to dry for some time then wash off with lukewarm water. This is my favorite remedy. It's no secret that carrot juice is full of skin-healing Beta carotene, however you have to gulp in carrot juice and apply topically at the same time for reducing scar visibility. i. Juice 4 or 5 large carrots and drink on an empty stomach. ii. Mix just enough carrot juice with 1 teaspoon of sea salt to make a paste. Then massage the affected area in circular motion to avoid damaging the skin. iii. Leave the paste on the skin until it dries. iv. Rinse with warm water and pat dry. BONUS TIP: For pimples treatment, dab the pure carrot juice on the pimples after thoroughly washing your face to speed up healing and prevent scars before they form. Yes! Keeping your body well hydrated helps protect the skin from many kinds of problems and also helps in detoxification.